When people think of casinos they think of a handful of classic games and blackjack is always near the top of the list. It’s one of the games you can count on finding in any casino on the internet or in real life. Luckily for everyone if you know the basics, blackjack is one of the best bets in the entire casino. And if you learn more advanced strategies, you can actually turn the odds in your favour playing certain kinds of blackjack. This article will tell you everything you need to know to get started playing if you’re a beginner, or improve your game if you’re already an intermediate player. Blackjack is a great game because compared to a lot of casino games it gives the player lots of options to use strategy. 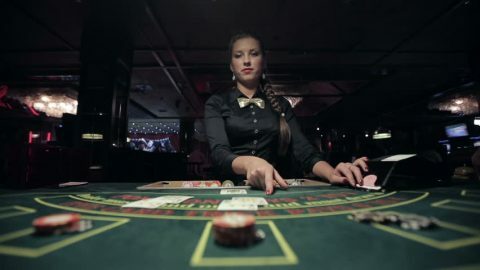 In games like roulette or baccarat you just make a bet and sit back to see what happens. Blackjack is way more interactive. 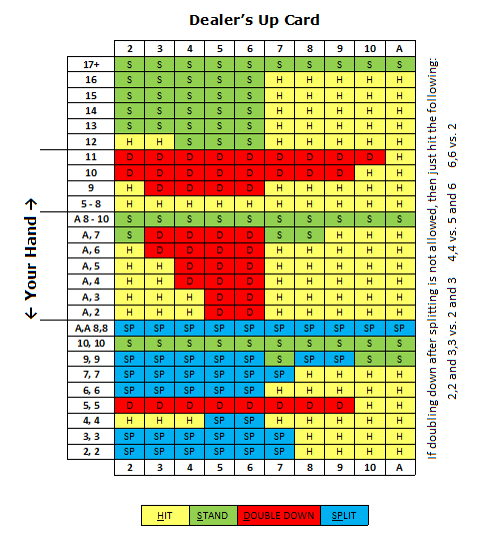 There are lots of ways to play hands so it’s a game you can continue improving at over years of playing. The goal of blackjack is to beat the dealer and there are two ways you can do it. The player beats the dealer if a) the player gets a higher-value hand than the dealer and does not bust or b) the dealer busts. If you go over 21 in blackjack, you bust. Aces can be worth 1 or 11, face cards are worth 10 and number cards are counted at pip-value. Your hand value is the sum of all the cards in your hand. Another rule to remember is that a “blackjack” is a special hand consisting of an ace and any ten-point card. “Blackjacks” beat all other 21-point hands and pay out 3 to 2 instead of 1 to 1. Every hand of blackjack starts by making a bet. The dealer gives each player two cards, both face-up, and deals themself two cards, one face-up and one face-down. The face-down card is called the “hole card”. Sometimes if you’re playing single or double-deck games in a brick and mortar casino, the players receive both cards face-down. If the dealer’s up-card is an ace, the dealer will offer each player “insurance”. This is a side bet on whether the dealer will have a blackjack when they look at their hole card. To take insurance you must make a bet equal to half your original bet. If the dealer has a blackjack you get paid 2 to 1 on your insurance bet. If you want to play the numbers, just avoid the insurance bet altogether. The reason is really simple. The odds against the dealer having a blackjack with an ace showing are 9 to 4. Since the bet only pays out 2 to 1, you’re going to lose money in the long run taking insurance. Hit – Take one more card. You can keep hitting until you choose to stand or bust by going over 21. Stand – No more cards and you stand pat. Double – Double your original bet and get ONLY ONE more card. Split – If your first two cards are either a pair or any two ten-point cards you can split them into two separate hands by doubling your original bet. When you split, the dealer will put a second card on each hand and then they each play out the same as a regular hand of blackjack. One thing to remember is that when you split aces, each ace only gets one more card. If you split a hand and the next card you get makes another pair, you can re-split that hand by putting up another bet equal to your original bet. Some casinos don’t allow re-splitting aces. Surrender – When the dealer is showing an ace or a ten-point card some casinos will let you surrender your hand and take back half of your original bet. Different casinos and different blackjack games have different rules when it comes to surrendering so make sure to check it out when you first sit down. After all players have taken their turn the dealer will turn over their hole card. If the dealer has 16 or less he will hit and take another card. At some tables the dealer will also hit on a soft 17 which is an ace and any number of cards totalling six points. If the dealer doesn’t bust, he will compare it to each player’s hand. The higher-value hand wins. Winning hands pay even money on the original bet, except when you win with a blackjack which pays 3 to 2 on the original bet. Make sure that the casino you’re playing at pays 3 to 2 on blackjacks because some casinos have started paying less and you should avoid those games. To make things easy on the dealer there are some simple hand signals you can use to tell them what action you want to make. Hit – In a game where you get both cards face-up, tap the table with your finger to tell the dealer you want to hit. In games where you get your cards face-down, scrape the cards gently towards yourself against the felt. Stand – In a face-up game wave your hand over your cards. In a face-down game, tuck your cards face-down under your bet. Double – In a face-down game, put both your cards face-up on the felt. Now double your original bet by putting the new chips right next to your first bet. If you have a pair you can signal to the dealer that you want to double and not split by putting your index finger up like you’re ordering one beer. Split – In a face-down game first put both your cards face-up on the felt. Then double your original bet by putting the new chips right next to your first bet. If you have a low pair the dealer might think you’re trying to double instead of split. To tell the dealer you want to split, point to your two cards with your index and middle finger in a V shape to say you want to play two hands. Blackjack’s roots can be traced through similar card games all the way back to the fifteenth century in Europe. It’s thought that card games grew in popularity after the printing press was invented since cards were cheaper and more widely produced. The oldest known ancestor of blackjack is a game was written about in the 1674 book The Complete Gamester by Charles Cotton. It was called Bone Ace and if know the basics of blackjack, you’d be able to play it. Aces could be counted as one or eleven, face cards were ten points and number cards were counted at pip value. The big difference was that you played to 31 points instead of 21. The first game that used the same 21-point system as blackjack was seen in the early 18th century in France. It was called simply vingt-un, French for twenty-one, and it was said to be a favourite of Napolean. It became a popular game in European Casinos and led directly to blackjack as we know it now. Over the years the rules have been developed with additional options like doubling down, splitting, surrendering and taking insurance being introduced.